I hope you had a great break and are ready to get back down to business this week with some rested legs! First, though, I do need to comment on how you guys rocked Wembley. I am attaching my photo from that run – you guys are amazing. We are so incredibly proud of all of you and how far you’ve come. 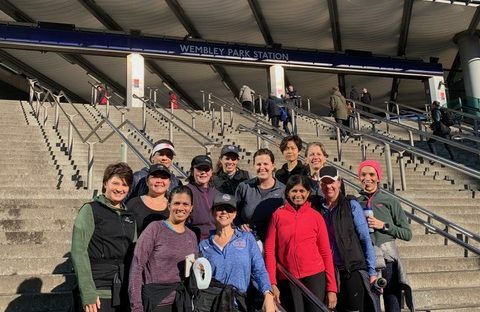 We have two more long runs to go and we know you can ALL do this.I saw Perla at Wellington Arch today as I was trying to get my own long run done – loved seeing her out on such a beautiful day in London! First, if you haven’t submitted information for the Milan photo directory, please do so ASAP. Just click here for the fast and easy Google form!I’ll start chasing you down soon if you don’t submit… Thank you to those who already have! Right now, the weather in Milan is looking a bit warmer than what we have had in London, but not too warm. So mid to upper-40s F/7-10 C is what is showing now for the race time starts about 2 weeks before the race, subject to change of course, and then warming up during the race. You should be trying out what you think you might wear on the race over the next week or so. Make sure nothing rubs the wrong way, think about layers, etc. Some people will buy a cheap outer layer that they plan to toss when they get hot so they don’t have to carry it. So think about whether you care if something is tied around your waist. My beginner year, I bought that cheap layer but I realized during the race that I was so used to having something around my waist that I didn’t care, so I kept it. Everyone is different, but think about what might work for you. This week and for Kew, we will plan to take our gels while running. We need to practice – we do not plan to stop to take the gels during the race. Sometimes the gel packaging can be tricky – so just resort to pulling the tab off with your teeth if you have to. This is why we practice 🙂 We will take the gels about 70-80 min into the run. bring money/credit card for margaritas and breakfast burritos! I have extra gels and will bring some with me this week for anyone who wants to try something new. Run down Wellington Road to Prince Albert, cross using the zebra crossing and then head down to the mosque where you enter the park. At the light, cross the Outer Circle and enter the park, keeping to the left and going over the wooden bridge. Run straight and take a slight left (not a hard left) and run, crossing over one cross path and turning left at the second one. 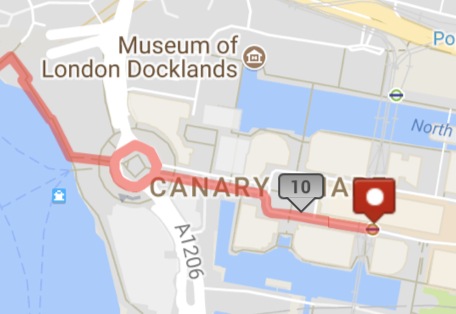 Run back over the Outer Circle, cross the canal and then take a right to go down onto the canal. 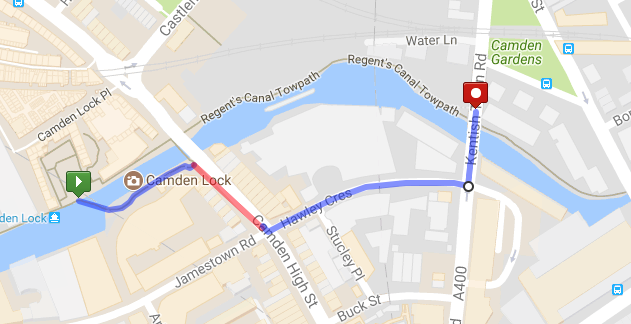 DIVERSION – Follow the bridge across the canal and turn right on Camden High Street. 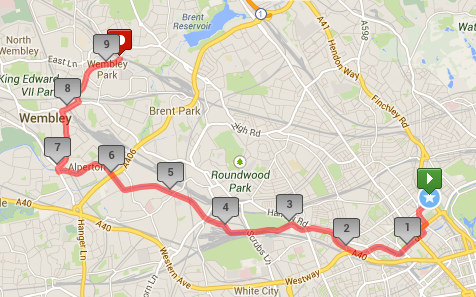 Take the first left on Hawley Crescent and then left on Kentish Town Road. 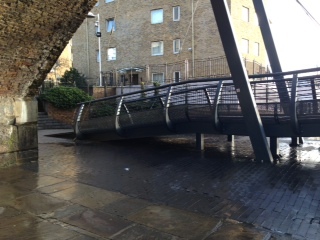 There is an entrance back to the canal path on the left side of the bridge. 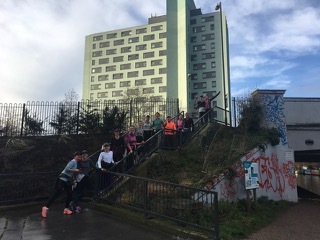 We need to run through the Angel neighbourhood until we can re-enter the canal path. At the wall follow the ramp up to Muriel Street. 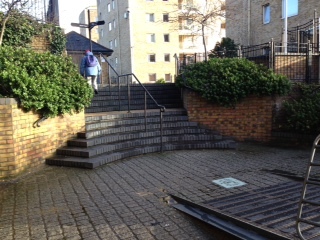 Take a right and then an almost immediate left up a path that winds between the apartment buildings. 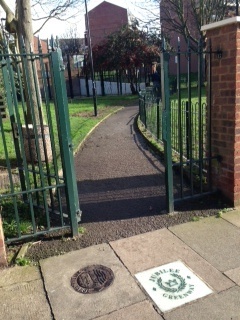 See the picture below for the entrance to the path. At the top of the brick steps, go straight. At the Limehouse Gallery and Bronze Age shop turn right. Run along the water until you reach the second metal foot-bridge leading to a park. Cross the bridge and run through the park. After the park, you’ll run straight, under an arch and the water will be on your right. Run with the water on your right until you see the long flight of steps next to Royal China – see picture below. You’re almost there! Run up the steps and run one full time around the traffic circle. Then run a half circle and continue on as if you had run straight ahead from the steps, through the small park to India Drive and then veer slightly right along Cabot Square. You’re heading for the big skyscraper building in front of you. 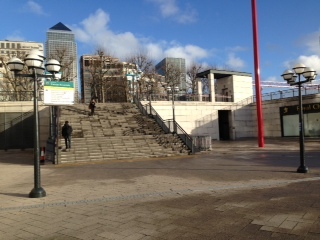 Stop when you see the sign for the Canary Wharf DLR Station at the ‘mall’ entrance on the South Colonnade. We’ll meet at the Tortilla inside the building, just right of the entrance. Yay! I hope those of you who ran the Winter 10K had a fun time! It looks like you had cold but sunny weather for it. I can’t wait to hear all about it! Congratulations! This week is ASL’s parent teacher conferences. I am hoping most of you were able to schedule your conferences so you can run. This week’s route is not complicated so if you aren’t able to come on Thursday, hopefully you can get together with others. But let me know if you will not be able to make this Thursday. On Tuesday 12 February in the morning, we’ll be collecting money and distributing the WRW shirts and hats. We will also be collecting money for certain expenses for the Milan Half-Marathon trip. More details to follow. This week we are going to try gels on the run. I saw a few of you with them last week. Gels are basically carbohydrates to give your body some extra fuel during the race. For the most part, we train in a way to teach our body to use fat as a fuel. Fat is easier to access as an energy source and requires less fine-tuning in terms of timing carb intake during exercise. Our bodies have about 1000-1200 “easy access” calories available which will get most ladies about 10-11 miles (depending on their weight and fitness level). After that we will use gels (carbs) to fuel that last 2-3 miles of the half-marathon. We, your coaches, will tell you when you should take the gel. We will plan to use them on our longer runs going forward so we get used to taking them – we don’t want anything “new” on race day to throw us off! On Thursday, we will bring a bunch of gels that you can sample. You can try different flavors and brands and decide what you like (it may be helpful to keep the packet if you like it so you remember it). Then you can buy some either online or at running stores. In general, gels don’t taste great but they will either give you a boost after about 6 – 8 minutes or, if you’re like me, they will keep you from losing energy. 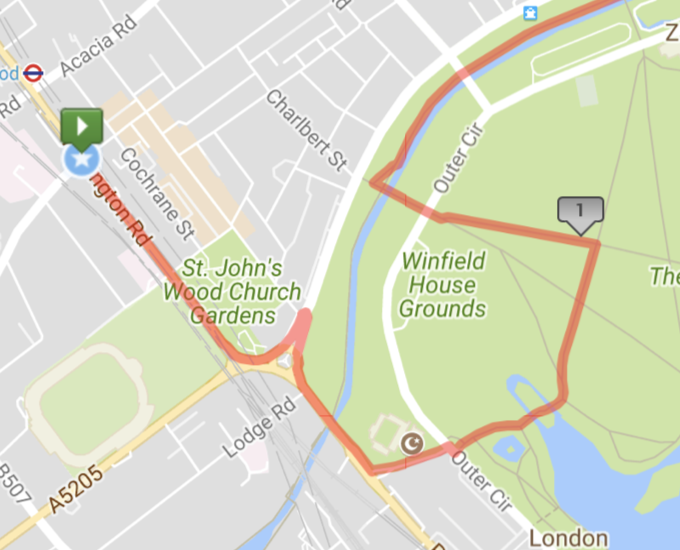 For this run we head to Hyde Park via the usual route and run along the eastern edge of the park to Hyde Park Corner, under the arch and down Constitution Hill. Run pass the Victoria Memorial down the mall and enter St. James Park. 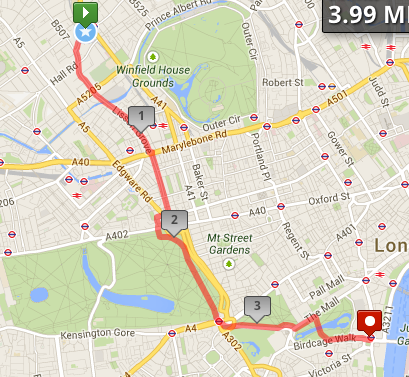 Run over the pond and out of the park, turning left onto Birdcage Walk and down into Parliament Square to Big Ben, then turn around and run the same route back to Starbucks.